This year, Copenhagen International Film Festival gave the audience the opportunity to watch three “master classes” lectured by three acclaimed screenwriters: Jim Sheridan, David Hare and Jean-Claude Carrière. I was happy enough to be able to go to the two first ones, as the last one was scheduled to take place on september 26th, and because of school I wasn’t able to be away from Randers for longer. Last year the festival brought Stephen Frears and Amos Gitai, among others. I wonder what they’re up to for the next year. 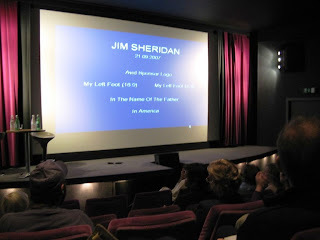 Jim Sheridan, who happens to be also a film director and producer, discussed about three of his most important films (My Left Foot, In the Name of the Father and In America), as well as his future projects, like the remake of Susanne Bier’s Brødre. About this last one, he said he will be as faithful as possible to the original version, the difference is that the two brothers in his film will be younger than in the danish director’s version. He confirmed Tobey Maguire and Jake Gyllenhaal as the lead characters, but for now he doesn’t have a name in mind of who will be playing the female character (played by Connie Nielsen in the original film). It seems like this information had been already added on imdb before the class. David Hare, who brilliantly adapted Michael Cunningham’s novel The Hours to the big screen started the class stating that he’s not a screenwriter, but a playwright who wrote scripts. “I’d hate to have my living depending on this profession”, he claimed. He pounded that it’s frustrating the lack of recognition a screenwriter receives, which is true. He has also directed some films in the past, but stopped directing because he wanted to work in the theater, which would make filmmaking impossible, as he would have to dedicate his entire life to it. I didn’t realize, but Hare was present during Jim Sheridan’s class, which happened one day before. He commented on one of the things Sheridan had said and he agreed on it: the fact he also doesn’t get films like Pirates of the Caribbean. Sheridan said he doesn’t get a movie like this because there are only images and no kind of narrative in it. In which David Hare added the next day: “I don’t understand this thing of show, show, show and never tell. But I almost get to understand The Bourne Ultimatum“. He has a nice sense of humour, doesn’t he? The irish filmmaker shared his personal experience on writing the script of My Left Foot, based on the true story of Christy Brown (Daniel Day-Lewis, Oscar winner for this role), who was born with a severe cerebral palsy and learned how to paint and write with his left foot. Sheridan said he wrote 60 pages of the script during an airplane trip, with a borrowed pen and with his coat over his head, because he was crying (due to the family memories that were brought up, I suppose). He said that airplanes make him nervous and this kind of stress makes him write a lot better than just sitting at home. About Daniel Day-Lewis acting in this film and in two others also directed by Sheridan, he said he never directed Daniel in a film and that Daniel knows exactly what to do with his own part: “Daniel is a like a director on the set, I mean, take Gangs of New York, he’s so far ahead that I’d like to say: Hey, come back, Daniel!”. And he adds, that for this reason, Leonardo Di Caprio had no chances in that film: “He (Di Caprio) is one of the best actors in the world, but in that film he looks like a kid in comparisson to Daniel”. Before My Left Foot started being shot, the actor said he wanted to learn how to paint with his left foot and so did he. According to Sheridan, he spent weeks doing that and during the shooting he refused to leave his wheelchair, which caused quite some problems in the set, as people had to lift him through the cables on the floor. “He’s a method actor”, said Sheridan. About In America, the moving drama of an irish family who immigrates to USA and more specifically, to NY City: As many people already know, the film is based on Sheridan’s own struggles in America in the 1980s. He said that he added different characteristics to the main character, elsewhere, the male character, who was supposed to be Sheridan himself, would become too boring. He said he thinks the first very scene of the film is badly shot and the narrative voice of the little girl was an idea that came out after the film was nearly done. Like someone in the room pointed, I find this scene beautifully written and shot. It’s like in a couple of minutes we already become envolved with the story and its characters. The filmmaker also said that the Times Square scene in which the family looks amazed by Ny City’s greatness was supposed to be an unimportant scene, just a cliche element in the film. That’s why he couldn’t understand when Sean Penn approached him in the end of the film’s exhibition in a movie festival and said: “I loved the film. I liked the Times Square scene”. And Sheridan thought: “How come? You’re Sean Penn! That scene is like a japanese tourist thing”. Jim Sheridan sounded like a very simple and grounded person, almost like he was there to have a conversation with people rather than lecturing. He didn’t even notice when the two hours were gone, and could have continued chatting for two more hours. A successful british playwright, David Hare doesn’t seem to be willing to quit the stage and dedicate a life career to the cinema. However, when questioned by one of the people in the audience about a possible return to filmmaking (he doesn’t direct a film in 10 years), he didn’t answer right away. He hesitated, sighed and a few seconds later, he frankly said: “I don’t know”. I haven’t seen any of his films, I haven’t watched any of his plays, but I can affirm he’s very talented when it comes to screenwriting. More specifically, he is very good when it comes to adapt a Literature piece to the screen. Hare talked about two of the films which scripts he wrote: Damage and The Hours. There was not much time left to talk about Damage, as The Hours‘ discussion took almost the entire master class time. On Damage (1992), directed by Louis Malle and starred by Jeremy Irons and Juliette Binoche, he said that everyone envolved in the film seemed to dislike it. In his words, Binoche hated Irons and Miranda Richardson hated the film. The talented british actress got furious for the fact she was Oscar-nominated for that film. “She wanted to be nominated by another film she did that year”, he said. He explained the process of casting Miranda Richardson despite her young age at that time, while her character was expected to be played by a middle-aged woman. Some scenes in the film were as dramatic as a greek tragedy, the film itself was a greek tragedy. Nevertheless, it was needed to cast the best actors in UK, and in Hare’s words, there was not a middle-aged actress good enough to play Ingrid, so they had to cast Miranda. Hare pounded that Miranda is capable of transforming herself, so her younger appearance didn’t matter, after all. “When you see her in the street, you don’t recognize her at first sight. Then, later you realize, oh, it’s Miranda!”. About Louis Malle, Hare said that the french director was one of the best things that happened to his life and that he misses him terribly. Between Hare’s words, it was shown three clips from The Hours: the scene between Laura Brown (Julianne Moore) and Kitty (Toni Collette), the train station scene in which Virginia Woolf (Nicole Kidman) breaks down and, finally, the final act, that begins with the arrival of a much older Laura Brown. Though he claims the most important scene in the film is the train station scene (watch part of this scene here), that gave an academy award to Nicole Kidman, Hare said that the opening scene was the one which he dedicated more labour. It took him two weeks to write the beautiful scene in which the three female characters are intertwined for the very first time. It was nice how he mentioned Collette and her great performance in this film. “Toni Collette is a truck driver’s daughter from Australia and she walks in the set for the first time and immediately transforms herself in an american housewife in the 1950s”. He said while other actors need to shoot some scenes before, in order to “enter” in the character, Collette didn’t need anything of it before saying her few lines. On Julianne Moore’s make up transformation, he said that firstly they shot the final act with an older actress, which didn’t work. “I told you so!”, Moore said, and they ended up aging Moore thanks to the work of the make-up artists. Hare points that make-up artists are as important as any other artist envolved in a film. “So many people said The Hours was impossible to adapt, that I started feeling freaky for thinking it was easy to adapt it”, he said. When questioned about the reason why he was chosen to adapt the novel, he smiled ironically and said: “I don’t have a problem on showing my feminine side”. And he indeed possesses enough sensibility to comprehend the female soul. I’ve read some imdb posts in which some people claimed that men couldn’t understand The Hours. I wonder which men are these, as I think this film isn’t exclusively limited to a female audience, and I’m sure that was the last thing Hare intended when he modified some of the book’s passages and added new ones. “A good characteristic to good directors is that they’re all open to criticism”. David Hare said that the arrogant filmmakers who refuses to listen to what other people have to say during the process of making a film are the ones that happen to be the bad kind of director. He prefers to write for actresses and be in a set with females instead of male actors, as he can’t remember an american actor these days that is not arrogant, while females are always willing to listen. It was funny how he described Meryl Streep cooking in the set and how a similar scene was added in the film, due to the particular way she manipulated the potatoes. “The composer is the most hated figure by the screenwriters”, he explained why by saying some written material could be ruined by a bad music. While he was in Copenhagen, his upcoming script for the movie The Reader was being filmed by director Stephen Daldry (The Hours), and that soon he would be joining the set, as he always follows the filmmaking. He said that the rights of the book belonged to director Anthony Minghella, “who only makes big films”, and “this happens to be a small film”. Nevertheless, Minghella gave to Hare the rights of the book for the period of one year, time enough for him to write a script based on it. David Hare tried to write a movie adaptation of Jonathan Franzen’s The Corrections, but has failed over and over, after writing endless drafts. “It’s a very difficult book, it’s impossible to adapt it”. The pictures: (1) At Dagmar Theater, a few minutes before Jim Sheridan’s arrival. The class was supposed to happen in a much larger theater, but due to the fact not half of the seats were filled (!!! 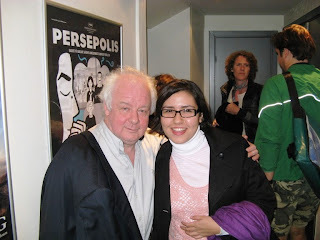 ), the festival producers moved the audience to this little room, (2) Me looking supernerd beside Jim Sheridan. I like the Persepolis poster in the back, (3) Me again, even happier and nerdier, beside David Hare. It seems like I was the only one who requested a pic standing next to him. 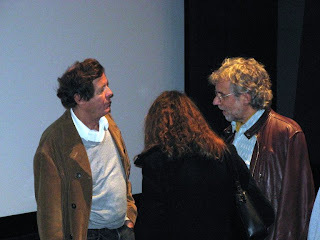 People were so blasé there, (4) David Hare (left), talks to people in the end of the master class. >Gaa, you completely floor me with your great posts. Seriously, Romeika, you *should* be selling this stuff to magazines and journals. It's awesome, and I haven't even stopped yet to look at the videos you've made.I love Toni Collette. She doesn't get a tenth of the acclaim and attention she should get for her talent. I have never seen her in a badly acted role.Love the personal things you convey about Jim Sheridan especially. Good, good, good.São maravilhoso!!! >omg david hare!!!! u lucky girl!! haha!!! love love the videos u made!! and GOD they're good! love! >Como essa minha amiga é chique! Romeika, esse post está sensacional. Espero que você não se importe com o fato de que eu fiz uma pequena cópia para mim. :-)Adoro "Terra de Sonhos" e acho que é um dos filmes mais lindos que eu já assisti. A gente sempre lê que, quando um diretor está fazendo uma história que é muito próxima ao que ele viveu, é sempre uma tarefa muito difícil de se fazer. Esse não parece ter sido o caso do Sheridan com "Terra de Sonhos".O David Hare fala sobre a dificuldade da primeira cena, na faixa de comentários do DVD de "As Horas". O Daldry fala que eles optaram por estabelecer todas as conexões entre as três mulheres logo de cara, para não ter que ficar sempre estabelecendo algo novo depois. E aquela cena é perfeita, com todas as suas similaridades e detalhes congruentes. A adaptação dele para o livro "As Horas" é simplesmente brilhante e a cena da estação é totalmente um mérito dele, já que foi completamente escrita por ele, sem ser baseada no material do Michael Cunningham.Amei mesmo, Romeika, esse seu post!! Parabéns!! !PS: O novo projeto do Hare a ser dirigido pelo Daldry tem a Nicole Kidman no elenco também. Já é algo mais a se esperar. A parceria deles deu certo demais da primeira vez, e espero que seja bem-sucedida novamente. >No meu comentário enorme, ainda me esqueci de falar sobre a Toni Collette. Eu acho que ela adiciona muita coisa ao filme e ao personagem de Kitty. No livro, a gente sabe muito mais coisas sobre ela. Na adaptação, muito do personagem fica subentendido. E isso é mérito completo da Collette. Junto com a Vanessa, irmã da Virginia Woolf, é o personagem de apoio que é melhor aproveitado pelo filme. >Wow, what an amazing experience! You are a lucky girl!Fantastic post! >Romeika, para quem se esqueceu de levar papel e caneta para a palestra do Sheridan, você se deu muito bem porque o texto está ótimo.A faixa de comentários do DVD de "As Horas" é bem rica nesse sentido, de mostrar como o Hare fez a adaptação, as mudanças necessárias. Mostra que ele teve dificuldades em se livrar de certas situações. Mas, é inegável que o trabalho dele é impressionante, até mesmo porque o livro do Cunningham é muito difícil. Concordo que todos os atores coadjuvantes de "As Horas" são muito bons e adicionam demais aos personagens e às histórias das três mulheres.Eu nem comecei a procurar ainda o livro "The Reader" porque as informações sobre o filme ainda são poucas, mas achei bem curiosa essa situação que você contou sobre a Alemanha. :-)Bom final de semana! >Que ótimo post, parabéns! Queria ter a oportunidade de frequentar esse tipo de evento (há pouquíssimos festivais de cinema aqui em Pernambuco, e geralmente não posso ir a nenhum). O Jim Sheridan é um ótimo diretor, adoro todos os seus filmes (contando aqui, acho que já vi uns cinco). "As Horas" é um dos meus filmes preferidos e o trabalho do David Hare é memorável.Parabéns novamente, ficou excelente! >Vinícius, obrigada! Festivais de cinema são importantíssimos, afinal, são nos festivais que temos a oportunidade de ver cinematografias dos mais diversos países, além de eventos especiais como esse. Infelizmente não moro na capital, mas não pude deixar de prestigiar esses dois eventos. Vc conhece mais da filmografia do Sheridan do que eu, só vi três filmes dele, esses que eu citei no post. Mas não deixarei de conferir o remake de Brødre. Abs! >Foi uma grande experiência mesmo, Wanderley, por isso tive que dividir as minhas impressões aqui nesse post, seria muito egoísmo guardar tudo só pra mim..:-) Tb estou de olho em "The Reader" e no que mais vier pela frente.